Do you ever feel everything around you is moving at a crazy pace, hitting you like a freight train, and, although you've adsorbed the impact and moved along with it, you just wish for a moment you could gather your thoughts, let alone catch your breath? Well, that's been my life for the last few months. Anyway, onto the pretty pretties. With every Collection, Givenchy always put my beautiful mind at ease. The Extravagancia Collection for 2014 Fall/Winter is voguish, darkly edgy, and (as the name would suggest) extravagant! From the upper leather casing, with its gold embossed pattern, the silver, pyramid-shaped, stud closer, to the stunning textures and color combinations of the products within, the Extravagancia Lip & Eye Palette (8,206 yen) has me, wholeheartedly, under its spell. I love when palettes come with a generous sized mirror...Bloody Mary anyone? 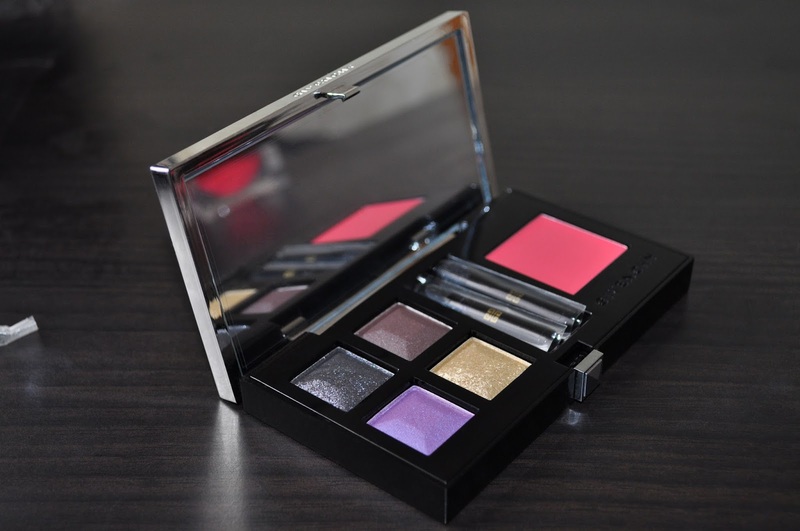 The Extravagancia Palette features four eye shadows, and a lipstick. A mauvish-graphite with silver and violet glitter. A satin, rose-based, brown with a mauvish-tinge and micro silver shimmers. A satin, pink-based, violet-purple with baby blue micro shimmers. A pale gold with gold glitter. Eyeshadows containing larger glitters always make me weary (thank you, Dior), however, the two glittery shadows in the palette put those fears to rest; they applied and blended easily with zero fallout or migration. 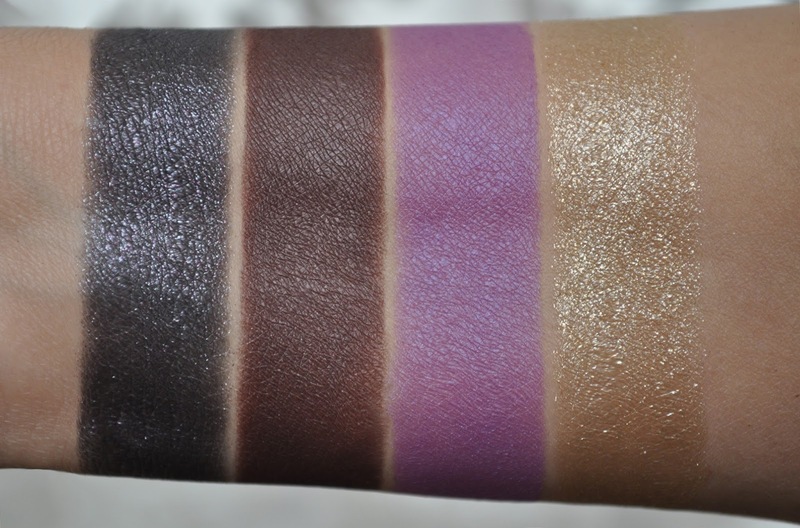 All four shadows are sickly beautiful! They perform wonderfully, and are perfectly pigmented. At first, I wasn't convinced with the color of the lipstick in the palette. Why was I doubting my precious givenchy?...I don't know?! Givenchy would never steer my wrong because the lipstick, and the eyeshadows, pair beautifully with each other. The Blush Memoire De Forme Pop Up Jelly Blush in Rose Extravagant (5,184 yen) has this wet, slightly whipped, bouncy jello-like consistency; It applied flawlessly...lasting all day, and giving the cheeks a beautiful, glow from within flush. I picked up both of the Le Rouge Lipsticks that were released with the Extravagancia Collection, but in this post, I'll be featuring 208 Rose Extravagant. Generally, 208 Rose Extravagant (4,644 yen) is not a shade I would reach for in Autumn/Winter. But, once again, Givenchy had the brilliant foresight of Rose Extravagant's exquisite harmony with the season;s eye looks. I like to either dab on the lipstick in a bouncing motion, or work it unto the lips with a brush and tone down the color's intensity. As with all the Le Rouge lipstick, 208 Rose Extravagant is creamy, moisturizing, seriously pigmented, and long wearing. 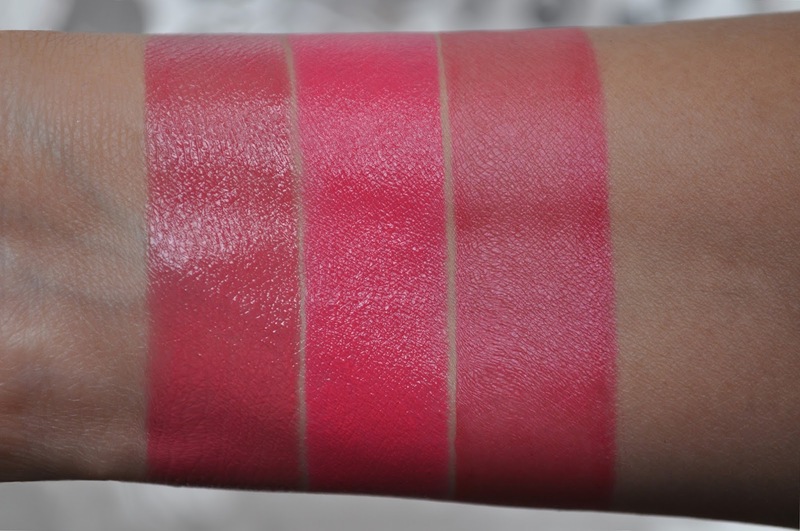 From left to right: The Extravagancia Palette Lipstick, 208 Rose Extravagant Le Rouge, Rose Extravagant Blush. The lipstick is a warm, yellow-based, pink-blush. 208 Rose Extravagant is a yellow-based, bright (almost neon) rose-pink. The gel blush is a bright, rosy-pink. Too Faced Primed & Poreless Primer. Givenchy Teint Couture Long-Wearing Foundation Broad Spectrum SPF 20 in Elegant Beige 4. Givenchy Blush Memoire De Forme Pop Up Jelly Blush in Rose Extravagant. Givenchy Ombre Couture Cream Eyeshadow in 8 Prune Taffetas(all over the lid and lower lashline). 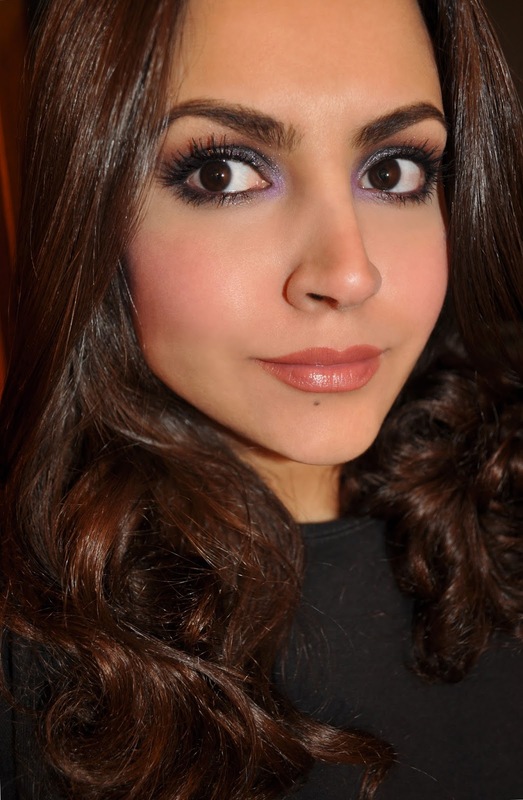 The violet-purple eye shadow (all over the lid and lower lashline). The brown eye shadow (in the crease and the outer half of the lower lashline). The pale gold glitter (in the inner corner). L'Oreal Le Grande Kohl Line & Define Pencil in Le Plum (used to tightline and on the waterline). Givenchy Le Rouge Lipstick in 208 Rose Extravagant. Givenchy Extravagancia Palette Lip & Eye: layered the lipstick in the palette over 208 Rose Extravagant. 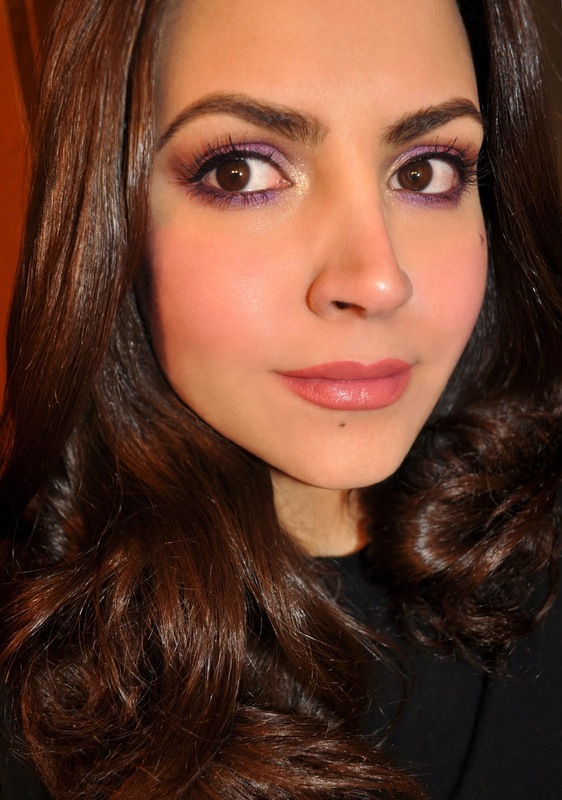 mixed the violet-purple and brown and applied it on the lid, blended into the crease and placed on the middle of the lower lashline and blended out, but not connecting to the inner or outer corner of the lower lashline. The pale gold glitter (applied wet on the brow bone). Tried to capture the gorgeous gold sheen on the brow bone, but failed. Givenchy Ombre Couture Cream Eyeshadow in 8 Prune Taffetas(all over the lid). The mauvish-graphite glitter eye shadow (all over the lid and lower lashline). The brown eye shadow (in the crease). The violet-purple(in the inner corner). L'Oreal Le Grande Kohl Line & Define Pencil in Le Plum(used to tightline and on the waterline). 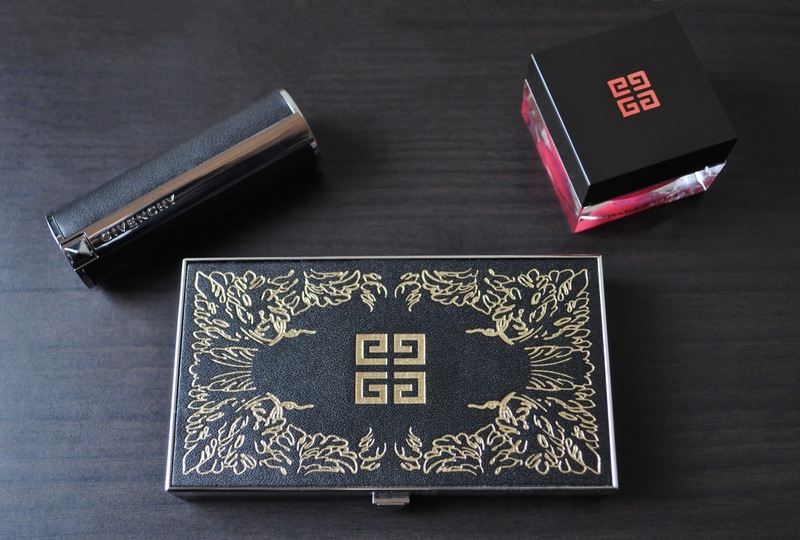 Givenchy Extravagancia Palette Lip & Eye lipstick. Did you get anything from Givenchy's Extravagancia Collection? OMG, I love both looks you did! Love how that taupe/grey all over your lid gives your eyes so much depth and that cheek color is soooo beautiful! stunning! I picked up the lipstick and palette and man oh man are they nice! I was wearing the palette two days ago and remembered how lovely the brown shade was in particular! Great review and lovely makeup looks! Oh, did you do a post on the looks you created? Id you did, please send me the link. I'm not sure if this sound silly, but every time I look at the palette, I get happy. You need to try this blush Grace! I'm not sure what part in the world you're in (where are you actually), but I believe you can still find it online.